Subject: Mr and Mrs William Robert Palmer, wedding portrait. (The Bridegroom) William Robert Palmer ( ); eldest son of Mr and Mrs Joseph Palmer, of Lymm. (The Bride) Mrs William Robert Palmer, née Joan Audrey Smith ( ); elder daughter of Mr and Mrs Isaac Smith, late of Silverdale, Carnforth; m. (1927) William Robert Palmer. 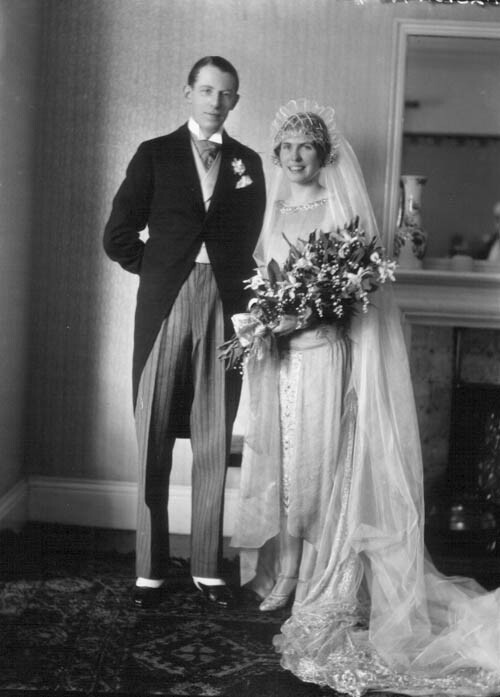 Occasion: The marriage, 25 May 1927, at Windermere Parish Church. No of relative negatives: 6. Occasion: The Times, 26 May 1927, p 1a.